Bright and airy 2 bedroom, 1 bathroom self-catering holiday apartment – sleeps 4. Large balcony and panoramic sea views. On site parking and Wi-Fi included. 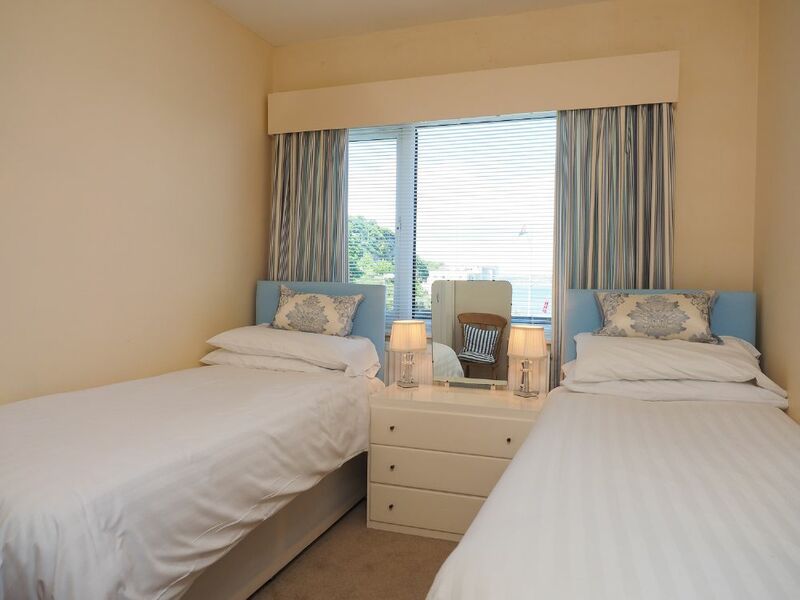 A 2 bedroom self-catering holiday apartment with stunning views of Brixham Harbour. 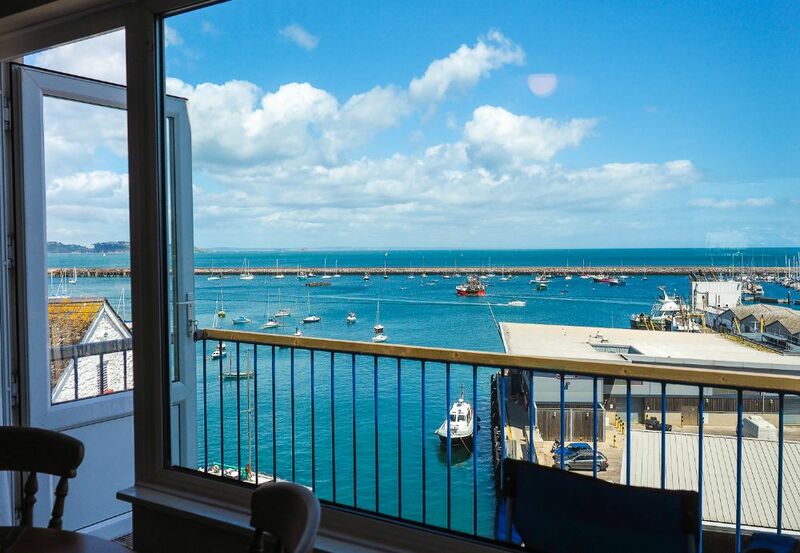 Enjoy spectacular views of Brixham Harbour and Torbay from the lounge, kitchen & bedroom windows of this ideally situated bright modern apartment. 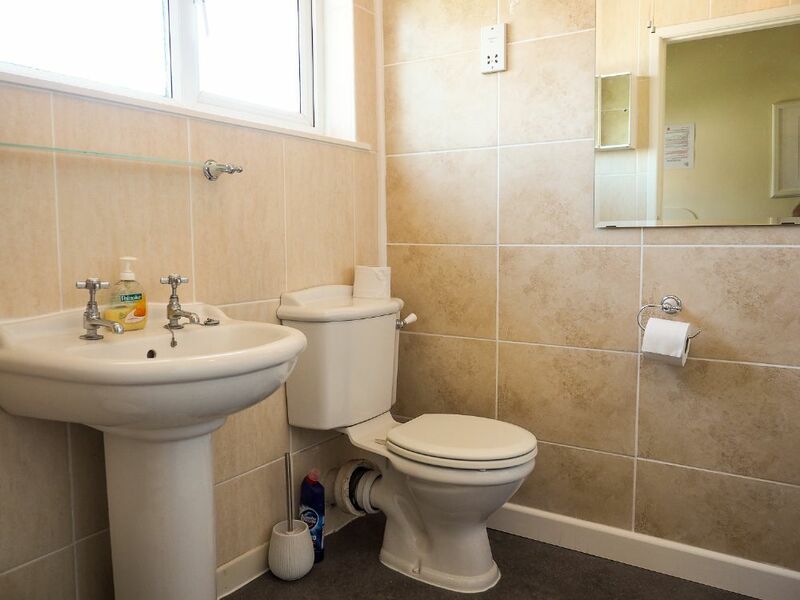 You are in a great location opposite Brixham Yacht Club on Overgang Road in Brixham – just a 2 minute walk to the harbour with all its cafes, restaurants and shops. This 3rd (top) floor apartment is in the best position - on top and at the front - of a small purpose built block. The lounge with modern furniture leads to a full width balcony with panoramic sea views. This property also has the very desirable benefit of a designated off road parking space within the grounds of the development. There is a master bedroom with a double bed and large window. The second bedroom can be made up as a twin or a King size - please specify when booking. The bathroom has a bath with electric shower over. Full gas central heating has also now been fitted, so you'll be toasty warm during the winter months. Short breaks - starting any day from 2 nights are available most of the year except peak school holidays when the property is available weekly Saturday to Saturday. Pots, pans, equipment, utensils, crockery, cutlery & glassware etc. Spectacular Harbour & Sea Views from full width window, with door to balcony. 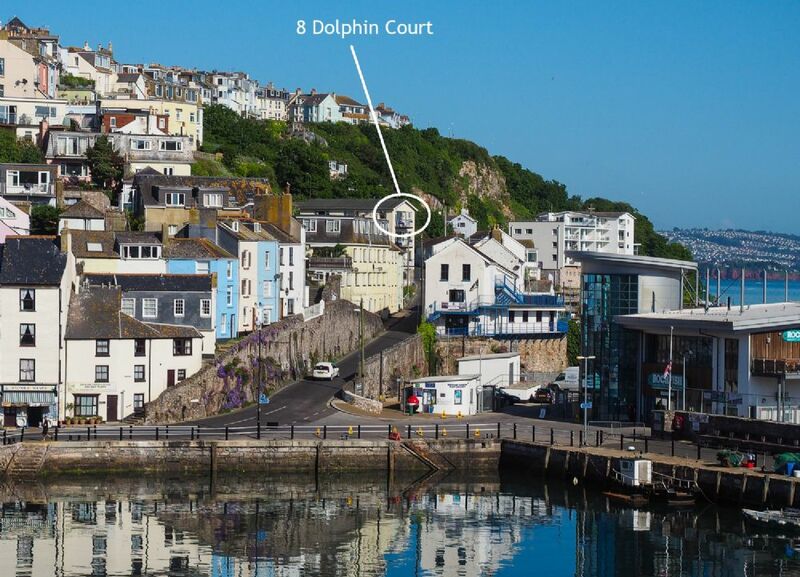 Having stayed in Brixham with Brixham Holiday Homes (different apartments) before decided to visit again and opted for 8 Dolphin Court due to nice views and ticking all other boxes. This apartment is well maintained, bright, comfortable, clean and has wonderful views from every room. The kitchen is well equipped, the lounge very comfortable and bright and even has a pair of binoculars for you to admire the views further, as well as watching the fishing boats and the seals that come into the harbour. It was also nice to just park the car in the space allocated and not worry about trying to find car parking. The apartment is in a good location for the harbour, town and coastal paths for those who like walking (like us). We had a fabulous 6 nights here in Mid-March 2019 and I would definitely stay there again if I were thinking of going back to Brixham. Booking was straightforward, check in and location details were received in plenty of time. Parking space is available. Fabulous location with great views in all directions. We enjoyed watching the seals and the comings and goings of the fishing boats. Lovely walks along the coast path in both directions and an easy walk to the shops. The apartment has plenty of kitchen equipment which we didn't use as we ate out! The bed is extremely comfortable as are the sofas in the lounge. I would thoroughly recommend this apartment, it is comfortable, has great views and there are plenty of places to walk to. Lovely apartment, very comfortable lounge and beds. The view is outstanding, had a great time and would visit again. Wonderful location with sea/harbour views from every room including the kitchen. The flat is very well equipped and a very short walk from the harbour/restaurants. having off-street parking was a real boon. Don't be fooled by the view - avoid at all costs!!!!!! To have to pay nearly a thousand pounds a week for this property is a joke. The place stinks of damp, and the bedrooms are set out like two student lets with cheap, ill matching, tired, dated furniture that a second hand shop would give away for bonfire night. The shower door that has been fitted has a half inch gap at the bottom (by design I might add) that allows water to flood the floor & I had to concoct some temporary cling film arrangement to prevent the flooding after my first shower. Despite the glorious summer weather, we cut our stay short by a day to get away from this place - dreadful. Brixham Holiday Homes, you should be ashamed to be connected with such a poor property, you will not be seeing my business again. Situated halfway up Overgang Road in Brixham, opposite Brixham Yacht Club - a 2 minute walk to the harbour and town centre. This property is on the top (3rd) floor, there is no lift. Overgang is a steep hill and not suitable for persons with mobility issues.